"When I prayed I was new, but when I stopped praying I became old." So said an early Christian leader. What is prayer? Prayer is doxology, praise, thanksgiving, confession, supplication and intercession to God. "When I prayed I was new," wrote a great theologian of Christian antiquity, "but when I stopped praying I became old." Prayer is the way to renewal and spiritual life. Prayer is aliveness to God. Prayer is strength, refreshment, and joy. Through the grace of God and our disciplined efforts prayer lifts us up from our isolation to a conscious, loving communion with God in which everything is experienced in a new light. Prayer becomes a personal dialogue with God, a spiritual breathing of the soul, a foretaste of the bliss of God's kingdom. How is one to pray? Only the Holy Spirit can guide us to pray as we should. Just as a child learns to walk by walking, one can best learn to pray by praying, trusting in the help of God. Put your whole soul into prayer. Think about the meaning of every word you pray. Make it your own personal prayer. Be persistent in prayer. Don't yield to carelessness or neglect. Strengthen your prayer through a lively faith in the Lord, a spirit of forgiveness toward others, and genuine Christian living. As we pray deeply within our hearts we grow in prayer. By the grace of God we suddenly catch a glimpse of the miracle of the presence of the Holy Spirit working within us. At first it is only a spark but later it becomes a flame freeing and energizing our whole being, provided we do nothing to grieve the Holy Spirit; and if we do sin we repent of our sin immediately and ask for God's forgiveness. To experience the fire of God's holy love, to give it space within us to do its cleansing and healing work as a breath of the Holy Spirit, and to use it as light and power for daily living - such are the goals as well as the fruits of true prayer. 'My Orthodox Prayer Book' is published with the hope that it will help Orthodox Christians in their private and family devotions. Reflecting the treasures of Orthodox worship, it contains basic cycles of daily and other prayers. The language is contemporary yet maintains a liturgical flavor. Traditional prayers have been slightly revised so as to be more readable in English. Some new prayers, many selections from the Psalms, directions for Bible Study and brief explanatory notes are also included. 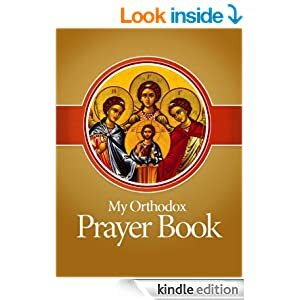 It is humbly offered as an encouragement to Orthodox Christians to pray and grow in the life of prayer. I'm Dr. Mike Moses, founder and lead pastor of Lake Forest Church in Huntersville, NC. Open Mike is a forum where I am more open than my sermons, and I interact with you over a fresh imagining of what it means to follow Jesus. More about me, music on my iPod, favorite links and friends in the blogoshpere. My friend David's book is ensuring sanity for me, as I slowly cherish each chapter. If you suffer from 'hurry sickness' as I do, perhaps this book is for you too. My wife Angie published her first novel a few years ago. #1 I'm proud of her. #2 It's stinkin' good (tension between dreams and duty for a young mother). #3 This book will never be published and stocked in a 'Christian' bookstore with the picture of a beatific looking prairie woman on the front wearing a bonnet - there's grittiness of real life like happens to real people, and perhaps some grace. #4 This link is to the Kindle version, look below for paperback also. #5 Angie had in mind precisely the type of 'given up on church but not on God' folks we love so much to welcome at Lake Forest as she wrote. Minister Angel on What does the Bible say about...how to treat other religions? wheelan on What does the Bible say about...how to treat other religions?